Sevilla's La Liga title hopes were damaged as a mistake by goalkeeper Sergio Rico led to a draw at Alaves. 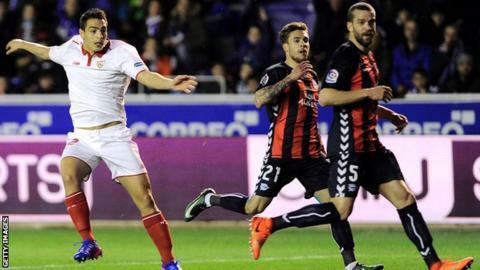 Jorge Sampaoli's side knew a win would move them two points behind leaders Barcelona and they went ahead through Wissam Ben Yedder's drilled strike. But Rico fumbled Oscar Romero's inswinging cross with 15 minutes left, allowing Aleksandar Katai to bundle in. The Spanish keeper redeemed himself to save a Katai free-kick and a Deyerson effort as Alaves finished strongly. The result leaves third-placed Sevilla four points behind Barca after 26 matches and three points behind Real Madrid, who have a game in hand. Alaves stay 11th. Asked about his error, Rico said: "It was a move which was unlucky for us. We will keep going like this, we will keep fighting and we will not give up until the end of La Liga." Match ends, Alavés 1, Sevilla 1. Second Half ends, Alavés 1, Sevilla 1. Hand ball by Deyverson (Alavés). Attempt missed. Stevan Jovetic (Sevilla) right footed shot from outside the box misses to the right. Assisted by Joaquín Correa. Offside, Alavés. Óscar Romero tries a through ball, but Deyverson is caught offside. Attempt saved. Óscar Romero (Alavés) left footed shot from outside the box is saved in the centre of the goal. Assisted by Marcos Llorente. Theo Hernández (Alavés) wins a free kick in the defensive half. Attempt missed. Marcos Llorente (Alavés) right footed shot from outside the box misses to the right. Substitution, Alavés. Nenad Krsticic replaces Víctor Camarasa. Attempt missed. Mariano (Sevilla) right footed shot from outside the box is close, but misses the top right corner following a corner. Corner, Sevilla. Conceded by Marcos Llorente. Theo Hernández (Alavés) is shown the yellow card for a bad foul. Foul by Theo Hernández (Alavés). Attempt saved. Deyverson (Alavés) left footed shot from the centre of the box is saved in the centre of the goal. Assisted by Kiko Femenía. Substitution, Sevilla. Stevan Jovetic replaces Wissam Ben Yedder. Deyverson (Alavés) hits the bar with a left footed shot from a difficult angle on the left following a set piece situation. Attempt saved. Aleksandar Katai (Alavés) right footed shot from outside the box is saved in the top left corner. Mariano (Sevilla) is shown the yellow card for a bad foul. Aleksandar Katai (Alavés) wins a free kick in the attacking half. Substitution, Sevilla. Joaquín Correa replaces Gabriel Mercado. Foul by Óscar Romero (Alavés). Attempt missed. Vicente Iborra (Sevilla) right footed shot from the centre of the box is too high. Assisted by Steven N'Zonzi. Goal! Alavés 1, Sevilla 1. Aleksandar Katai (Alavés) left footed shot from very close range to the centre of the goal. Offside, Sevilla. Nico Pareja tries a through ball, but Pablo Sarabia is caught offside. Substitution, Sevilla. Mariano replaces Vitolo. Vitolo (Sevilla) is shown the yellow card. Hand ball by Vicente Iborra (Sevilla). Vicente Iborra (Sevilla) wins a free kick in the defensive half. Attempt missed. Óscar Romero (Alavés) left footed shot from outside the box is just a bit too high. Assisted by Aleksandar Katai.